Earlier in the week Pearl and I picked a couple of big bags of apples from a old apple tree in our neighborhood. It is one of those city fruit trees that no one seems to notice or do anything with. 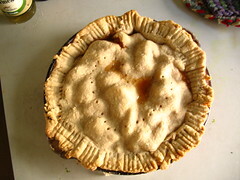 The apples are bumpy and blemished from neglect but still work great for cooking. They are even beautiful in their bumby irregularity and spots. We are in a time right now as a family of financial vulnerability so picking up apples from a neglected city fruit tree makes a lot sense for us right now. God always provides for us. And it seems like times like these when things get kind of scary his provision becomes even more tangable some how. It is as if God allows these situations for us to be reminded of our total dependence on him. It is in these times that we seek him out. These times are very uncomfortable but good. It's like those nights that are hard to fall into sleep because you are so full of worries and then you begin to pray and end up falling asleep knowing that somehow things are going to just work out some how and the next day of so something happens to give you hope again. That pie tasted so good. It tasted good becuase we were hungry. It tasted good becuase we went through the trouble of picking the apples our self. It tasted good becuase it was home made. It tasted good because it was so clearly from God's hand. I really appreciate this hard time we are in right now for the way it makes me feel more alive.